The main objective of this symposium is to provide a venue for information sharing on extension of small-scale aquaculture, specifically targeted to those individuals and relevant organizations involved in various aquaculture development projects. The symposium will also assess and present the effectiveness of “farmer-to-farmer extension” approach in the implementation of relevant aquaculture development projects in the region. The symposium was organised for stakeholders in JICA-assisted projects in SE Asia and Africa. 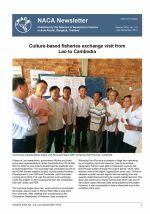 Culture-based fisheries exchange visit from Lao to Cambodia. National Fish Day, Cambodia. WAS Adelaide: Special Session on Regional Cooperation for Improved Biosecurity. Inbreeding and disease in tropical shrimp aquaculture: a reappraisal and caution. Shrimp EMS/AHPND Special Session at DAA9. 2nd International Symposium on Aquaculture and Fisheries Education. Report on Sustainable Fisheries and Aquaculture for Food Security and Nutrition. 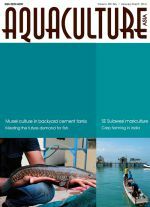 Towards meeting future demand for fish: Aquaculture in inland or marine land or water-based systems? Status of carp farming in India. Recent trends in mariculture in southeast Sulawesi, Indonesia. Murrel (snakehead) culture in backyard cement tanks: A breakthrough and a success story. Mobile telephony - ICT eneabled fisheries extension service for sustainable shrimp farming. 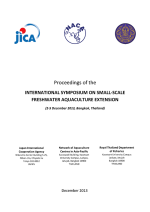 International Symposium on Small-scale Freshwater Aquaculture Extension. 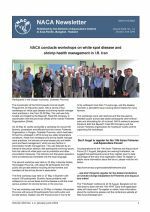 Report on early mortality syndrome / acute hepatopancreatic necrosis syndrome of shrimp. 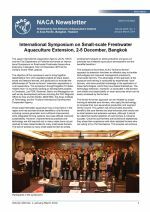 International Symposium on Small-scale Freshwater Aquaculture Extension, 2-5 December, Bangkok. 12th Meeting of the Asia Regional Advisory Group on Aquatic Animal Health. National Workshop on EMS/AHPND of Cultured Shrimp held in India. Report on early mortality syndrome / acute hepatopancreatic necrosis syndrome of shrimp. 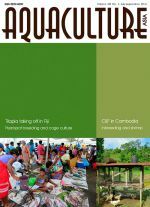 Sustaining Ethical Aquaculture Trade Newsletter. India and the AFSPAN Project. Report on AFSPAN Chilean survey. 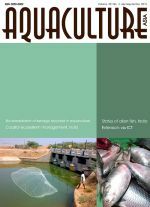 Feeding and feed management of Indian major carps in Andhra Pradesh.